One of my all-time favorite series reached its epic finale this week. Cullen Bunn, Brian Hurt, and Bill Crabtree gave us all a triple-sized final issue that was extremely satisfying. 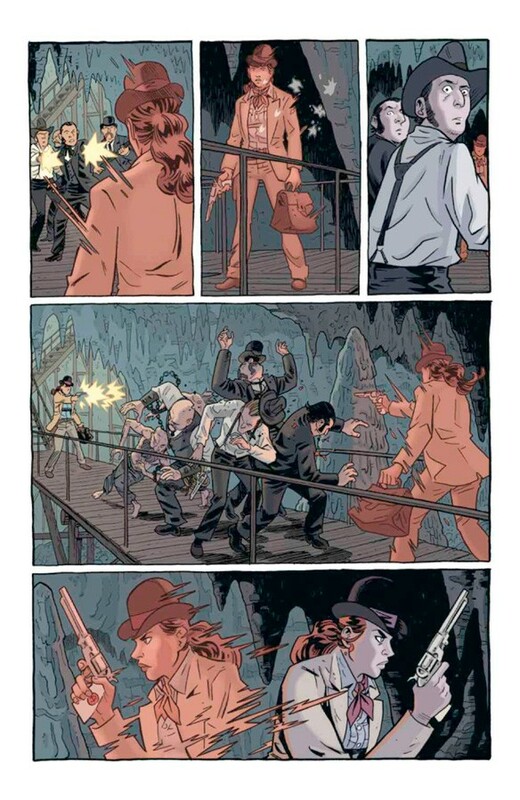 As Drake and Becky journey in the land of the dead with Billjohn leading the way, it becomes clear that the team is going to have to make it through one final battle if they wish to succeed. The depth of characters that Bunn created is nothing short of magical and the journey that they embark on is one for the ages. I loved learning about Drakes sordid past and watching the tremendous growth that Becky had throughout this series. I hope that one day my daughter can aspire to be as strong and fearless as the great Becky Montcrief. The conclusion of this story was fitting, surprising, and emotional. I want to take this time to thank Mr. Bunn for sharing his gift and this story with us all. It ranks in my top 5 series of all-time and I am glad to see him end it on his own terms. I hope that we revisit this world as we have in some of the spin-offs, but I am content for now. 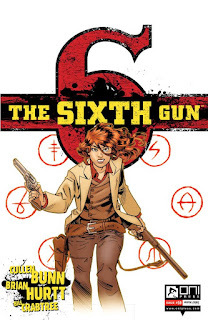 Instead of our usual recap of comics, in honor of The Sixth Gun, I thought I would share my top 5 moments from the series in no particular order. The Story of Griselda and the Wyrms - Issue #41 - Bunn does a masterful job actually humanizing someone as vile as Griselda. In this issue we learn that she was once a human child and the events that changed her to Griselda the Grey are quite troubling. Griselda was tossed into a pit as a child to appease an ancient darkness. She was sacrificed for the good of her people, but when she arrived at the bottom of the pit she could understand the terror that dwelled below. The Great Wyrms saw her as a sister, taught her about the six, and used her in attempt to return to their full glory. This was a chilling issue, and one that set up an epic moment in the finale that just barely missed this list. Billjohn "hides" the guns - Issue #10 - It became apparent early on that the guns weren't safe no matter where you hid them. In order to protect the guns, you had to be cunning. This series opened with a bang (sorry) and Drake found himself in possession of four of the guns right off the bat. He knew he needed to hide the guns and that he could only trust them with Billjohn, his best friend. The only problem with that plan is that Billjohn was dead. Fortunately he was killed by one of the six. The one that allowed you to be called back by the person who shot you dead. You were some sort of clay golem, but one that proved quite useful throughout this series. Billjohn played an amazing role throughout this series, but his role in hiding the guns was my favorite. The issue without dialog or sound effects - Issue #21 - I am a sucker for a good action movie and as I poured through the pages of this issue, watching Becky rescue Drake from the Knights of Solomon, it felt like I was at the movies enjoying an amazing sequence from a summer blockbuster. Through the immense creative talent of Bunn, Hurt, and Crabtree, this issue remains one of my all-time favorite issues of any series despite the fact that not one word is uttered. Hurt was really able to flex his artistic chops as I was on the edge of my seat the entire time. I wish more comics took risks like this. The heartbreaking story of Asher Cobb - Issue #14 - When we first meet Asher Cobb, he is a giant mummy hell bent on killing Mr. Sinclair. It seemed he was going to be another bad guy standing in the way of destroying the six, but as the series unfolded we learn that Cobb is a very complicated character and one who is easily manipulated by toying with his emotions. His origin story is one that really grounded him and cast him in an entirely new light. Asher had a troubled childhood on account of his rapid growth and his troubling visions of the future. He had only one friend in the world, a young girl named Ruth who treated him with kindness the moment she met him. As Asher grew up he ended up serving the Union in the Civil War. This made him quick enemies of General Bedford Hume and sensing his life was in danger, he ran and hid. Through his visions he learned of his own death, but more troubling the death of Ruth because he was not there to protect her. (sniff) This proved to be a great motivator in his attempt to befriend whoever wielded the six. Becky wakes up from her Ghost Dance - Issue #35 - In an effort to save her own life, Becky embarks on a Ghost Dance in the world of the spirits. She sees different versions of the six throughout time and different versions of Drake. Not only was it fascinating to learn more about the history of the six, in the conclusion of this thrilling arc, she sees a world that resembles how she might remake it. Her father is alive, she is a married to Kirby Hale and the mother to their children. Confronted by the version of her in this world, she learns that she cannot use the six for her own desires. This finally brings her back from her Ghost Dance and this is another defining moment of the growth of Becky as a strong character. The epilogue in which Griselda kills Missy Hume is equally as stunning and is the icing on the cake for this arc. There are many other moments that just missed the list and I encourage everyone to take advantage of the sale on ComiXology to purchase every issues in this series. Thanks again to Cullen Bunn for sharing his creative genius with the world. I am a bit saddened to see this series come to an end, but look forward to what else you have in store for us.